I have talked in the past about my fondness for Urban and City base adventures. Back alleys all the way up to court intrigue have been something of a rare-privilege of mine in my games. 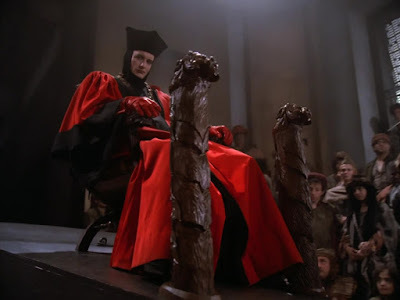 With WotC coming out with their new D&D Waterdeep Dragon Heist adventure (which looks awesome by the way, "D&D meets Ocean's 11") I got to thinking about something I have never successfully fun. I REALLY want to do a courtroom drama in a game. Especially a D&D game. You know as well as I that Players and Characters will do something that will end them up on the wrong side of the law and they are going to need lawyers and a trial. I briefly covered this in a post WAY back when in Lawyers, Guns, and Money. But that was for a modern age and a quirky bunch of characters/lawyers. What I am looking for is a great court-room drama. Life and death stakes; bribe, graft, witness tampering, surprise witnesses, hostile opposing counsel, mysterious deaths. All of that. I have yet to figure out HOW to do it. The great thing is once I do figure it out I can drop it into any campaign. Because like I said back then "sooner or later, your characters are going to get into trouble and they are going to need a lawyer". Anyone ever try this? I am even willing to try the old trope of a "celestial court". Love to hear what have all done. Oh. You better believe that there will be someone in the whole deal that's a stand-in for Warren Zevon. Cause that is just the way my games work. It's the summer of 1986. My regular DM has graduated from High School and is getting ready to go to the Air Force. We are gearing up for an epic world-changing round of adventures we call the Dragon Wars. Essentially this is our World War I. I can't recall if this cover played into that at all, but I would like to think it did. It' July 1986 and this is issue #111 of This Old Dragon. This is also one of my top 10 favorite colors. The white and black dragons in a "ying yang" theme has been done before, but not quite like this. It is another winner from Denis Beauvais. While meant to invoke the struggle of good vs. evil D&D players will look at it and proclaim "they are both evil!" Sheesh...not appreciation for art. Speaking of art. The Letters section covers the disparity between male and female figures on the cover of Dragon. The all too common complaint is that females tend to be nearly naked and men wear sensible armor. We are still having this conversation. Our first article is by John M. Maxstadt, Good stuff, for a spell. Magic focusing: a new dimension for possessions. This deals with a common problem, what sort of magic item does a mid-level magic-user need? The solution is a Spell Focusing item. Now off the bt I have an issue with the term. What is being described in this article is not spell focusing but rather spell storage. The MU casts a spell into an item to be used later. Essentially these are variations on the Ring of Spell storing only in wands and other items. I don't want it to sound like I am dismissing this article. On the contrary, I rather like it and the author brings up a number of points I still see in my games. For me a Spell Focus should make casting a spell easier or harder to avoid. I have also allowed some spell focuses to change the die in which they use. A wand of fireball focus would change the die from a d6 to a d8 for example. Ah. Now here is one I remember. Welcome to Malachi: Visit a city where magic reigns supreme by Becky Helfenstein is about a city of magic. We are still a year out from the Forgotten Realms and their Waterdeep and Suzail cities. This is also the time my DM and I had started to put together our own "Urban Survival Guide" for playing in cities. This article is "class" focused. So what do clerics do, where do thieves go, what about fighters? and so on. Not a bad way to set it up, but also leaves some gaps. Ok it's only an article in Dragon, size alone will mean there are gaps. I think a series of articles on Malachi would have been great. Maybe I should do a series myself on The Urban Survival Guide. I don't all the original docs (that was 30 years ago) but it might be fun to pull various resources together to discuss this. 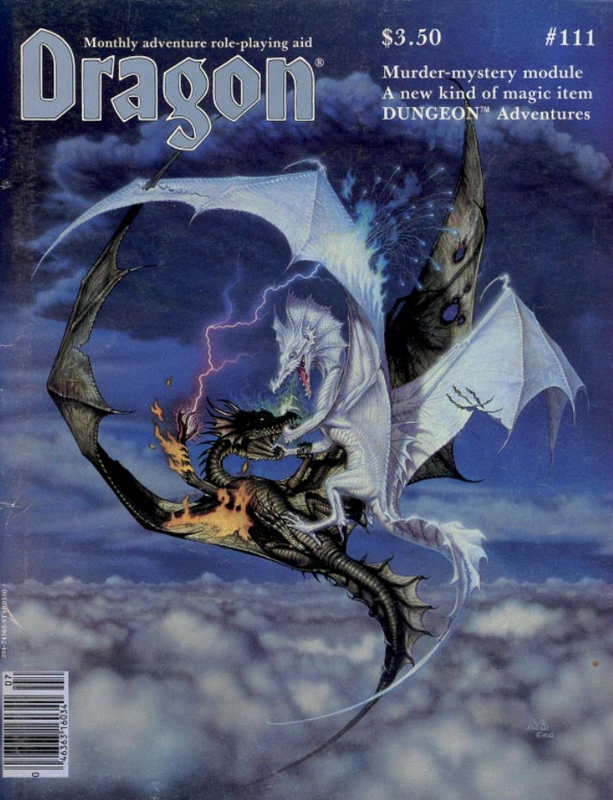 Dragon and White Dwarf, the tables in the old DMG, the newest books on DriveThru. Could be fun. A lot of fun really. Roger E. Moore is up telling us everything we need to know about how to submit articles to the newest TSR Publication Dungeon Adventures. 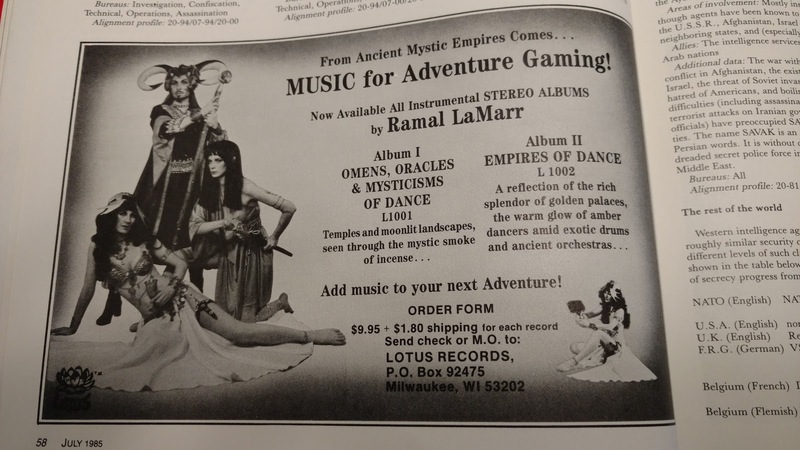 Back in the day I had worked on a couple of adventures with the intent to submit them to Dungeon. Never did, I could not get them to work out the way I wanted. But it was great practice really. No campaign ever fails: What to do if your game gets out of control by Joel E. Roosa deals with a common problem that I still see today. It deals with a game/campaign where the characters get quickly overloaded with magic items. I made this mistake in my first 5e campaign. Fresh off of a magic-saturated 4e game, 5e doesn't like a ton of magic items. My son is seeing this now with his 5e game he is running. In AD&D I always put a cap on the magic. In my game there was something like 4 or 5 +6 weapons TOTAL in the entier universe. The most powerful you could hope for was +5 or +3/+6 where the +3 was normal attacks and +6 was against a very specific creature type. In D&D 5 this cap is +3. I wish I had reread this article before I started my Come Endless Darkness game. Kent Colbath gives us a microscopic bestiary with Microscopic monsters: When they get bigger, they get a lot tougher. So paramecium, dinoflagellates and the like made huge. An interesting idea, but one I'd only use in special occasions; never as a random monster. Actually, they would make for interesting encounters in the Astral Plane. 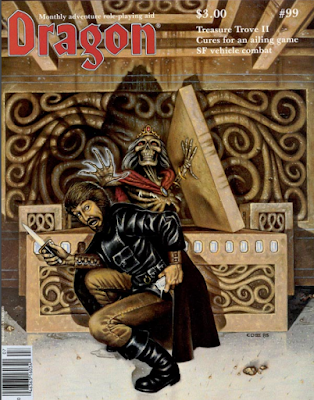 The centerpiece of this issue is an adventure, Death of an Arch-Mage, by Michael D. Selinker. It is a tournament-style murder mystery adventure for AD&D. No levels are given (that I was able to find) but that makes sense. This is a thinking adventure, not a combat one. 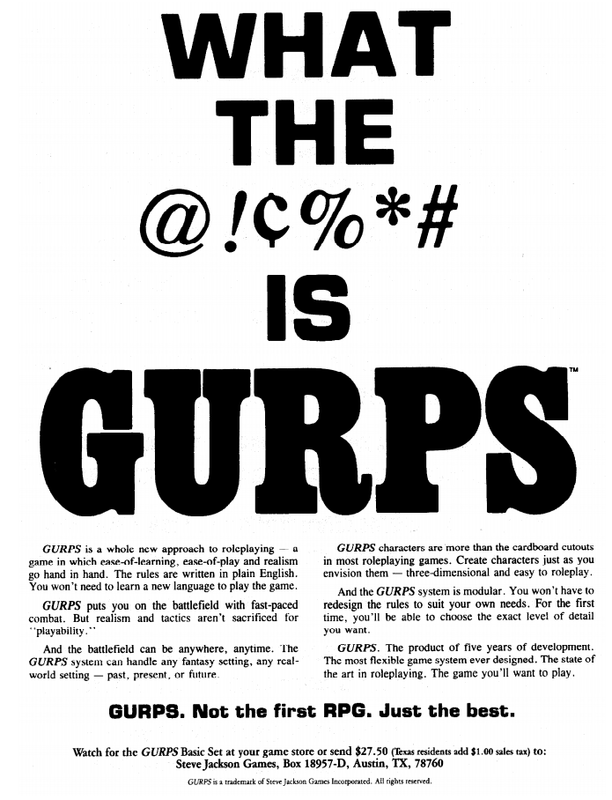 The NPCs range from 0-level humans to 18th level. The adventure itself is really kind of awesome. I love a good murder mystery and I have often wanted to do a Sherlock Holmes/Agatha Christie-style adventure. I bet this one would work fantastically with other versions of D&D. This one is worth trying. The adventure is long, becasue there are a lot of details the DM needs. Anyone ever do a murder mystery? Kevin Marzahl has some details on grenades for the Top Secret game in Pull the pin and throw. We get too our Ares Section now and on tape we have a few of the most powerful Super-powered Heroines in different universes. Ok, confession time. I was looking over three different Dragons for this week. I opted for this one since it had Maxima and Super-girl in it. 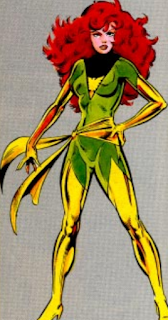 Roger E. Moore is up with arguably the most powerful person in the Marvel Super Heroes Game; Phoenix. If you grew up in the 80s and read comics you knew Phoenix. I played a little MSH and enve I know there are not many Class 1000 anythings out there. Phoenix is a Class 1000 Psychic. 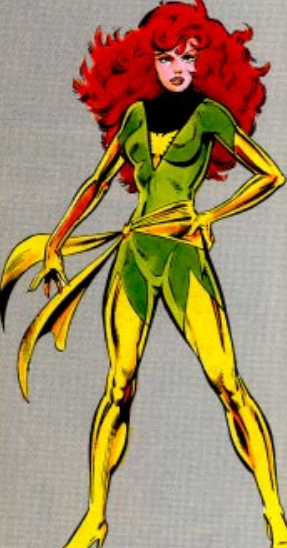 The article, which is long for a Marvel-Phile, especially one dedicated to just one character, gives Phoenix her due. I will admit I used aspects of the Phoenix cycle in my own Buffy the Vampire Slayer games just like I use (and still use) aspects of Crisis on Infinite Earths in my D&D games. Jack Herman is up with his (or is it Jeff Dee's, I never really knew) character Maxima. Back from the future in VILLAINS & VIGILANTES gaming. Maxima is one of the most powerful characters in the V&V line. She is a scientist from the far future sent back to Earth of 1986 to stop the Apocalypse that destroys mankind, sadly the trip damaged her and she has forgotten much of what she knew of her time and why she is here. In the new Mighty Protectors game we still see Maxima, so glad to know she is still doing her thing. I think it would be great to see a new Mighty Protectors version of Maxima. 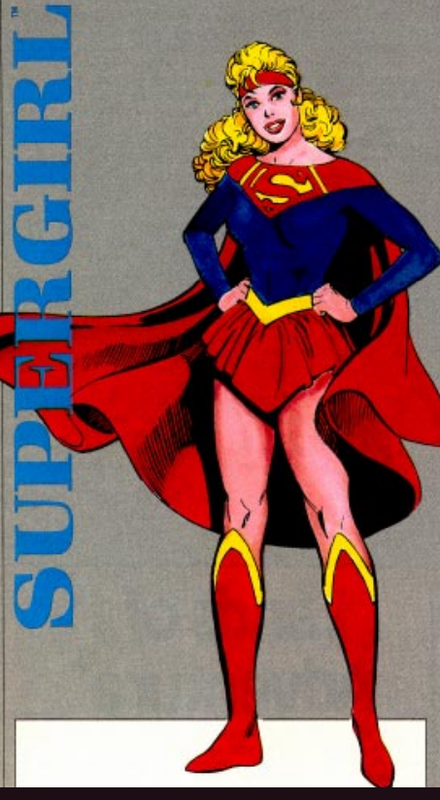 Greg Gordon, not to be outdone, has a write up for Super Girl for the DC Heroes game. He make the argument that she is (was, this is just post Crisis) the most powerful heroine of the DC Universe. He makes a compelling argument really. Supergirl has had boost in popularity with the great CW show and performances by Mellissa Benoist. I am going to say, and have said, that future generations of fan will look on Mellissa Benoist as Kara the same way we look on Lynda Carter as Wonder Woman. Jeff Grub is next with the Marvel Phile on Longshot. How did this guy get mixed in with all these super powerful superwomen? Luck I guess. Not to be forgotten, George Mac Donald discusses super-super powers in Champions in Quantum. We are introduced to the heroine of the same name. I guess I should put up her pic too! Snarf. Con Calendar and Wormy round out this issue. So some great supers articles. I am DYING to put all four of these superwomen into the murder mystery above. I know! They are here to investigate the murder of Longshot! Fun issue, with one of my favorite covers and some great articles. You know who else had a good issue at this time? White Dwarf. 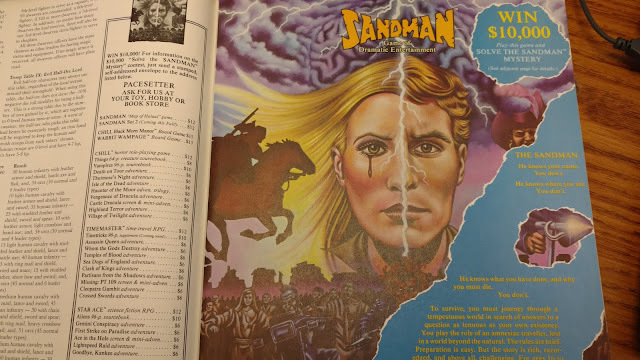 Pop on over and see what I was saying about July 1986 on White Dwarf Wednesday #79. Great issue, ridiculous cover.